“Stay in Your Heart” actually mean? An excellent question, what does it mean? 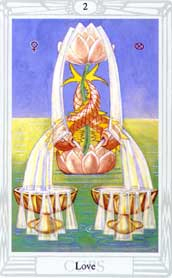 In the Thoth Tarot, the Two of Cups is a beautiful visual representation of Staying in Your Heart. Although the Two of Cups has a strong association with romantic love, there is a sweetness this image projects, which represents all waters of Love. As with all things of the aether, this is a particularly appropriate time to speak of matters of the heart, as the Sun ingresses into the realms of the heart; the sign of Leo, on Monday July 22, and goes directly into a Full Moon Opposition with the Moon in Aquarius. Mired in density, here on beautiful GAIA, we are in essence Etheric or Light Beings. We are energy, there is no question, ask any scientist. On an Esoteric level, one aspect of our Light bodies are seven energy fields, associated with each stage of our spiritual evolution. There are many names for this type of energy, but I will use the term Chakras, as many of us are familiar with this concept. Collectively, we are currently experiencing the consciousness that is associated with the 3rd Chakra (third dimension), or Solar Plexus Chakra; it is ego, mind, personality and will power. Our world today has strongly developed the mind and personal power, and while these aspects of consciousness were very important to develop, just as the lower chakras of survival and procreation, we are now ready to move to the next level of Heart Centered Consciousness. Currently, we are experiencing a paradigm shift into the 4th dimension of consciousness, which is associated with the 4th Chakra, the Heart Chakra…. The experience of Heart Centered Consciousness is about being consciously connected to the source of All That IS. Letting go of attempting to control events and others and allowing ourselves to experience the world, from our Heart Center, knowing that when we are connected to the Source and Heart Centered, nothing can harm us. A few qualities of 4th dimension consciousness: love, compassion, empathy, intuition, understanding, acceptance, inclusiveness, and forgiveness; for others, for ourselves. Let go of fear and control and connect with the SOLAR FIRE OF THE HEART! At this Full Moon Lunation, Mars and Jupiter are traveling together in Cancer. Mars always activates what it touches, and with this energy intensified by the Full Moon, we are exuberant and confident in our desires. Mercury, still in Cancer has returned to direct motion; new endeavors, new relationships, we leap, we are expanding our energy into the emotional realm of LOVE. Venus enters Virgo on the day of this Full Moon and brings the much needed Earth Element, back to the inner realm. Venus filtering the Rays of Virgo supports discernment in matters of the heart; to balance the exuberance of Mars and Jupiter and emotions rushing from our hearts to our heads. As she is in the same degree as the Full Moon, she offers strong energy of understanding, balance and foresight to create lasting relationships. We are grounded in the Sacred Feminine of Virgo. To further support matters of the heart at this Full Moon, Juno (Queen of Heaven) in Aquarius opposes Ceres (Mother Earth) in Leo. Pallas Athena (Warrior/Strategist/Protector) crosses the Aries Point in Cancer, further inviting love into our lives. The Asteroid Goddesses seek to balance the desires of romantic love, with nurturing love for all beings. Find the Center of You..…the solid center of the Heart, connected to Spirit, The Universe, Love.